Look for the High and the Low occurred between 5:00 GMT and 8:00 GMT. 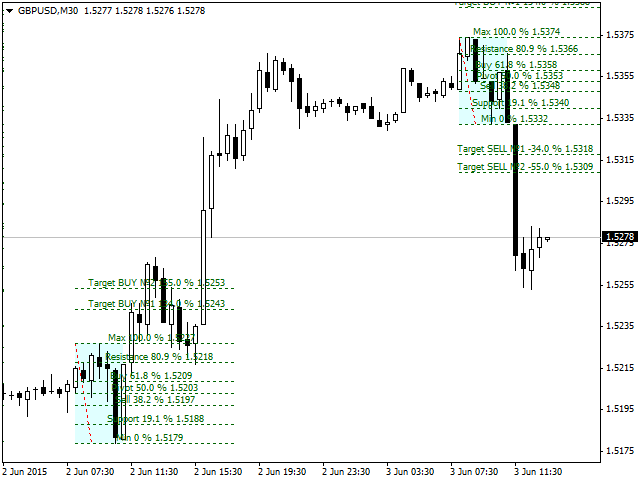 Plot Fibo from the High to the Low to indicate targets, support and resistance. Draw a 50% breakthrough line from the Low to the nearest High OR from the High to the nearest Low. 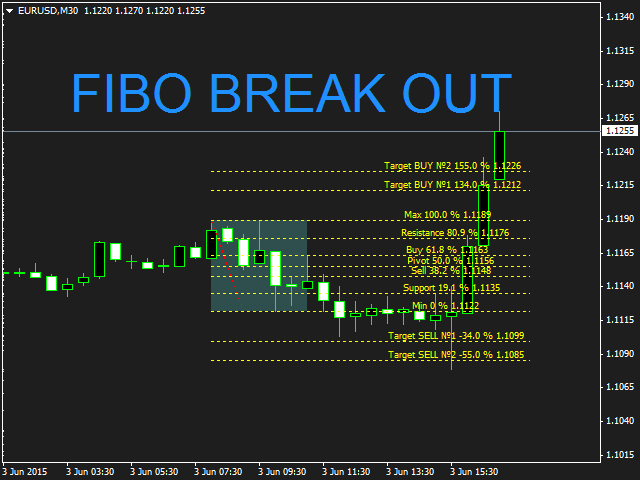 Wait for a breakthrough on the 50% Fibo line or trend continuation on the same level. Enter on the breakthrough or on the bounce from the breakthrough level. 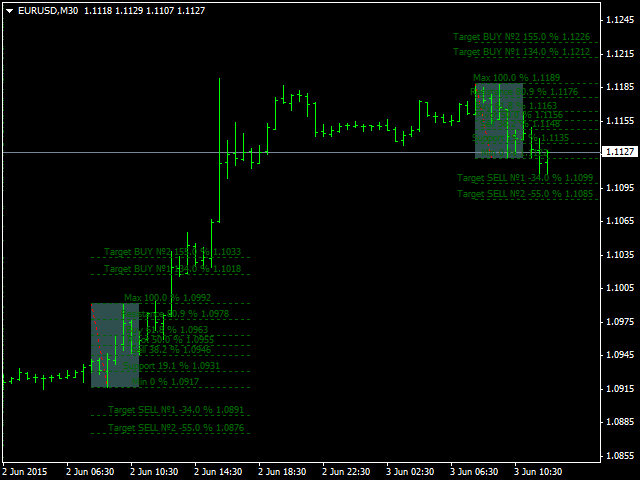 Adjust Fibo Bobokus to a newly appeared High or Low to see new targets. It is noteworthy: If you enter long positions, you should draw Fibo lines from the High to the Low of the last main movement before a reversal where you trade, so you could find support (19.1 %) or resistance (80.9 %), as the market usually comes back to these levels after the reversal. The number of days per - calculation period in days. Default value if 20 days. Start time range calculation - start time of the range. Default value is "05:00". 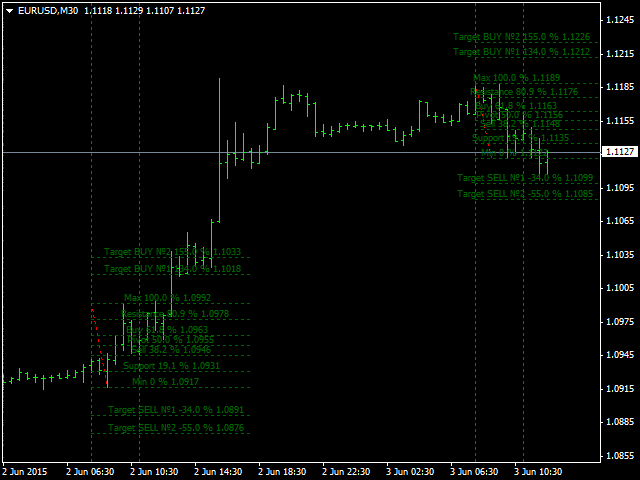 End time range calculation - end time of the range of calculation of max and min prices for the period. Default value is "08:00". The format of the output range - 1 - a line, 2 - rectangle. Rectangle by default. on/off drawing Fibo Bobokus - displaying Fibo Bobokus. Disabled by default. Color drawing Fibo Bobokus - Fibo Bobokus color. Color vertical line - color of lines. Color drawing Rectangle - rectangle color. 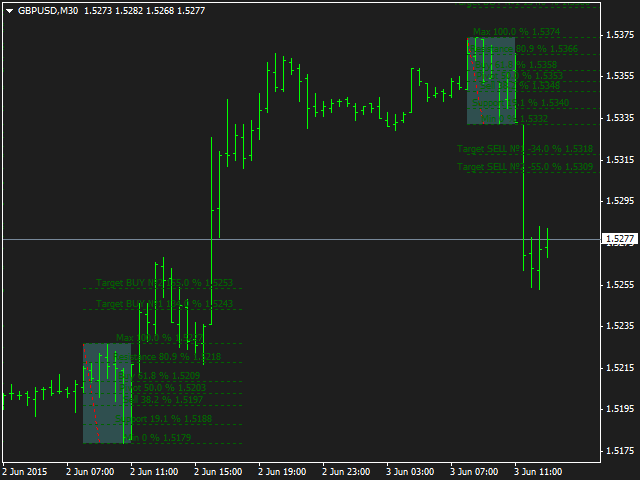 on/off beep START - signal of the range formation end.